Don’t be satisfied with stories, how things have gone with others. Shape shifting. What shamans propose is possible when working with the “unseen” and “unknown” within the mystery that pervades all of creation. Yet this is available to each of us. At this current time in our history it is urgent to “shape shift” into a new reality, an ancient knowing of who we are….really. Stripping away the words and the traumas that have contained our identity up to this very moment in time, harvested from cultural, family and ancestral dictates, standards and proclamations. 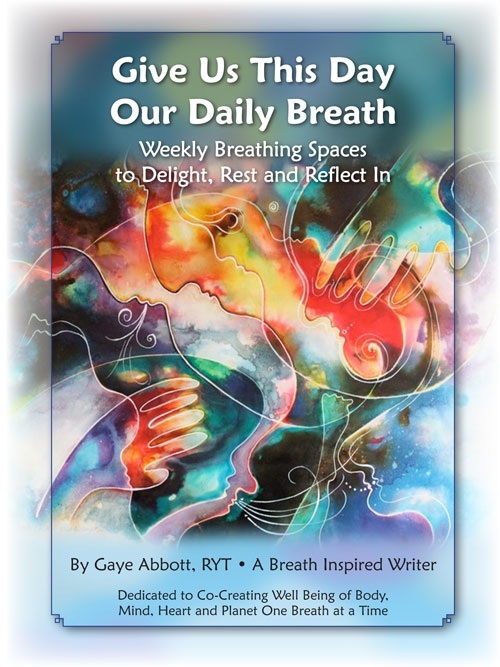 Wiping the slate clean with the movement of our bodies – a blank canvas before us where we can color in and out of the lines, curves, spirals and intimate spaces of our soul’s journey. Never a “finished” product, but an on going transformative improvisational art piece that is constantly evolving out of the true genius we came in with. Bringing forth the essence -innate gifts, expressions, talents – of what we were born with and beyond. Co-creating in collaboration with the life blood of the natural world, the mysteries of the cosmos and the whispers of Source into the depths of our heart and the strands of our cells – releasing the Soul to sing a song that no one else can replicate, yet everyone can hear. Creating by accessing the wisdom of Spirit and the expression of Soul that is within our very cells. Extending our roots deeper into the Earth and listening with them to the pulsation of all life inherent in our own unique path to wholeness. Uncoupling the sensations of past injury and emotional trauma from the thoughts and conversations that arise out of them. Taking the old “stories” by their tails and flinging them out into another realm that can contain them without harm to our being or that of other life. Brother David Steindl-Rast speaks to “The Double Realm” (a phrase he credited to German poet Rainer Maria Rilke). He talked about The Double Realm as a realm in which eternity and linear time coexist. All of us are simultaneously inhabiting these two worlds – the part of awareness that is in tune with eternity and the part that is walking the path of current life flow. Even more – a reason to “color out of the lines” and consider that the great eternal unfolding of life that brings us sorrows and pain, as well as joys and freedom to express ,is asking us to trust – implicitly. And though we have a unique soul-print to open and explore in our life, it can only be accessed within the interconnected relationship to all life. Every moment informs the next – communicating on such a vast scale that the subtleties are lost on us until we wake up one day and surrender. Surrender to the unfolding. Surrender the myth of separation. Surrender the pain and the joy. Simply surrender. Only then comes the freedom to unfold our own myth……. Make a way for yourself inside yourself. Stop looking in the other way of looking. Sometimes we are enveloped in darkness and shadows and can’t see clearly enough to find our way back on the path. A woman often thinks that once she gets older (and wiser presumably!) that her path will be well lit always. That may not be the case however. Yesterday Austin had powerful and passionate weather. I had my first taste of hail the size of – well no, not golfballs, but about half that size anyway. My patio was filled with these white orbs from the sky. One minute I was engrossed in a book that I was reading and the next thing I know thunder rocks the house. Soon following that the hail started and it was the most amazing thing as the temperatures here have been in the high 70’s and up through the 80’s. How is it possible to have hail with such warm temperatures? I know there is a scientific explanation for all of this, but sometimes we just have to admit that it just is and marvel at the diversity of it all! After this great storm (in which tornadoes touched down in other parts of Texas!) it was like it never even happened. The sun was uncovered and light came streaming in. 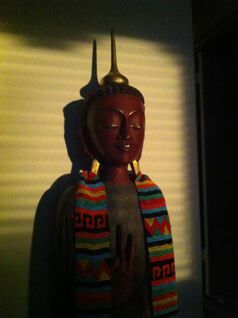 The picture above represents one single stream of light amidst the gloaming after the storm shining on the Buddha statue. Notice the shadows as well. These are the areas that are not clear to us as we walk along our unique paths. What possibilities lay in the shadows and in the storms of life?? Arising from the inside. Listen.